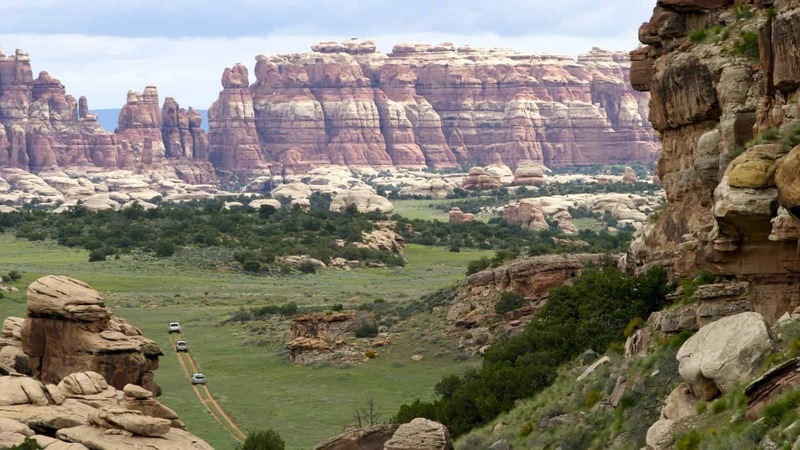 Of all the places I have explored, Southern Utah remains for me the most captivating, the most diverse and exceptional of the regions easily accessible to the North American overlander. 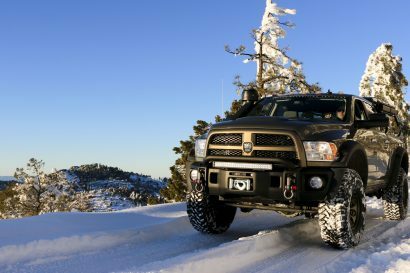 My praise is certainly influenced by my earliest memories of exploration: stalking big mule deer through the forests near Parowan with my dad, or trying to find the “Lost Lakes” near Cedar Breaks with my uncle Dave in the old Willys Jeep. But even beyond these youthful adventures, Utah continues to draw me back and leave me as wide-eyed as a child as its wonders unfold. The southeast corner of the state is dense with adventure and sparse with inhabitants—the perfect combination for an overland expedition. As with any great trek, the adventure starts long before leaving the house, with hours spent spreading old maps across the kitchen table and conducting detailed research on how to connect one route to another, one ancient site to the next. 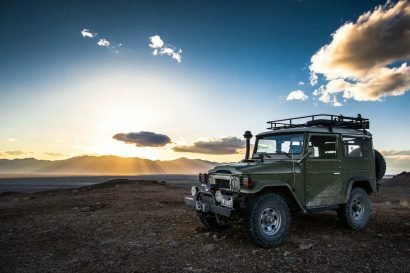 History remains infused throughout the process, as ancient civilizations’ treasures have been preserved by the arid climate, and century-old mining endeavors and west-bound wagon trains left a patchwork of dusty routes just passable by a modern 4WD. Chris Marzonie, Jeremy Edgar, and I had been traveling through the night, our departure delayed by the myriad of things that make disconnecting from home difficult—last-minute calls from the office, lost headlamps, petting the dog. Unplugging for this trip left a five hour dent in our travel time to the night’s camp near Mexican Hat. But the music was good, the sunflower seeds were fresh, and the miles ticked by along the quiet stretch of 163 in Navajo Country. We made camp one around 2:00 am. “We can sleep when we die,” Chris said, and camp was up in minutes, lit by the glow of our headlamps and fed by anticipation of the coming adventure. Despite the disadvantages of making camp well after dark, there is one upside: the surprise of your surroundings when dawn’s light illuminates the desert, revealing the distant view—or in our case, the house situated 100 yards from the dirt lot we were parked on. 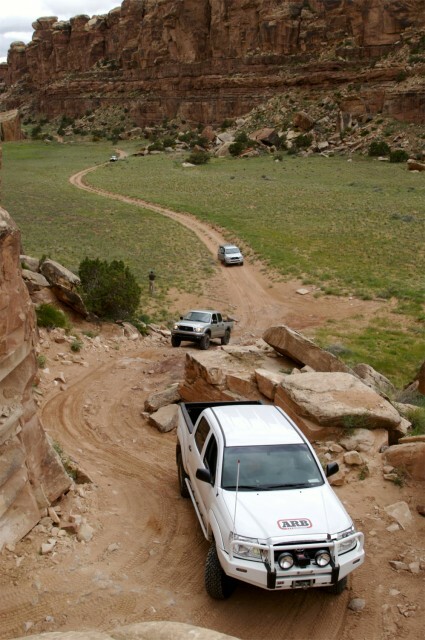 So we broke camp, piled into the Tacomas, and continued on to the meeting point in Mexican Hat. Meeting time was 7:00 am, which now felt way too early despite the goal of getting good light for our drive through the Valley of the Gods. Randy and Linda showed up right on time in their 2006 Tacoma. 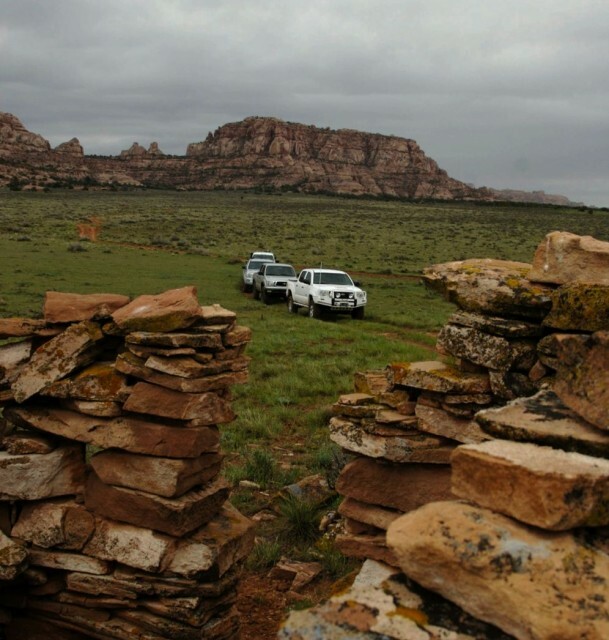 By coincidence, our group comprised four Tacoma double-cabs: my white 2004, a white 2005 prepared by ARB USA and driven by Chris, a silver 2002 driven by Jeremy, and Randy’s 2006. A quick breakfast at the San Juan Inn and Trading Post and we were on our way twisting along the graded Valley of the Gods Road (242). Progress was slow, as nearly every turn yielded another reason to stop and use the camera. The sharp towers of Organ rock, Chelly sandstone and siltstone rise above the silted valley floor, crimson pinnacles punctuating the skyline. 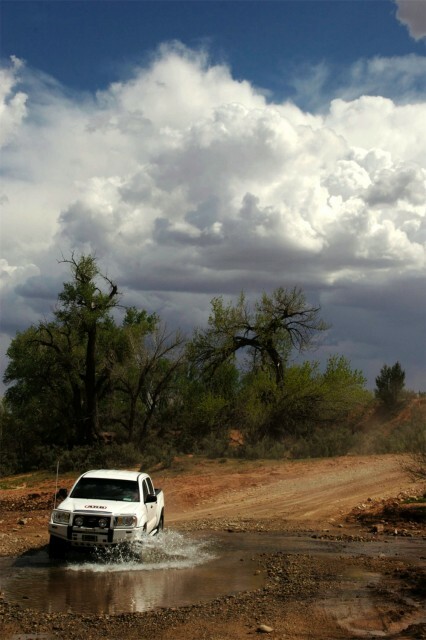 The 242 road terminates at Hwy 163, which provides access to our northern overland route along Comb Ridge and the Butler Wash Road. The route is easy enough, aided by lower air pressure to help absorb the near-constant corrugations. Comb Ridge is an impressive sandstone formation a mile wide and nearly 80 miles long, tilted slightly to the east, creating a massive catchment feeding the Butler Wash. 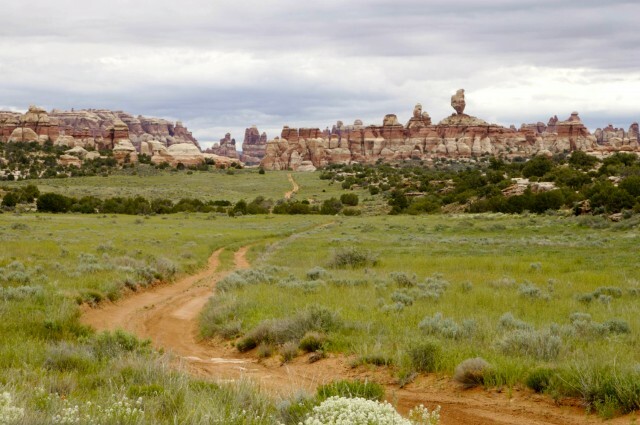 The trail moved eastward and upward along the flanks of Black Mesa, shifting the flora to cedar and juniper before connecting to Hwy 95. Before continuing north to Cottonwood Canyon, we took a short detour to the House on Fire Ruin, located a short hike up Mule Canyon. We reached the ancient Anasazi dwelling just as reflections from the afternoon sun set the stone ceiling ablaze with color, and our group, photographers all, scrambled to capture the effect on film—or CF cards, as it were. 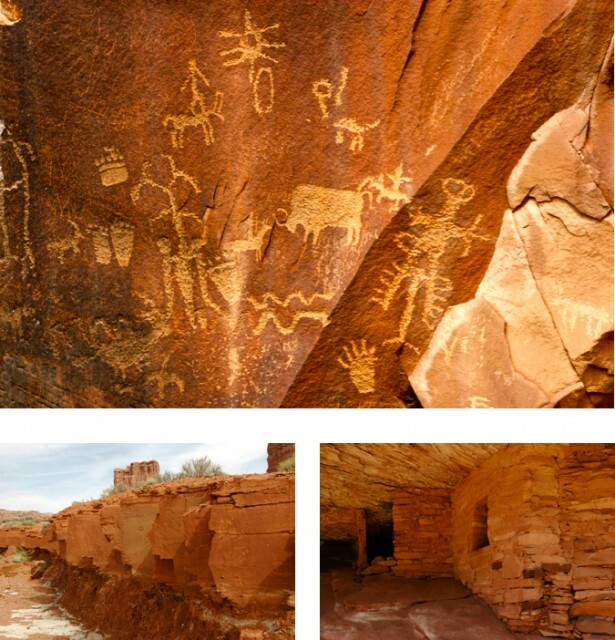 The name Anasazi came from the Navajo, meaning “ancient people” or “enemy ancestors.” We certainly felt the influence of ancient people on this route. Leaving pavement for the last time before the adventure’s end, we continued north on Cottonwood Canyon Road into the Manti La Sal National Forest and our goal of a camp near Davis Pocket. This improved route allows for efficient traveling as we gained elevation along Elk Ridge, the forest giving way on occasion to iron-rich canyons and rock formations to the north. The weather began a turn for the worse, with thick clouds collecting against the ridge and thunder echoing around our caravan. We decided to push beyond our intended campsite and seek shelter near Beef Basin. Beef Basin is appropriately named, as it serves as winter pasture for the Dugout Ranch and provides the connecting point to the more challenging overland routes to the north. The end of the basin marks the transition to Ruin Park and is guarded by a fantastic Anasazi tower, its portal open to the south and providing a commanding view of the entire basin. The strategic location would have served as an outpost to provide advanced warning of invaders to residents in the larger dwellings on the cliffs above Bobby’s Hole. 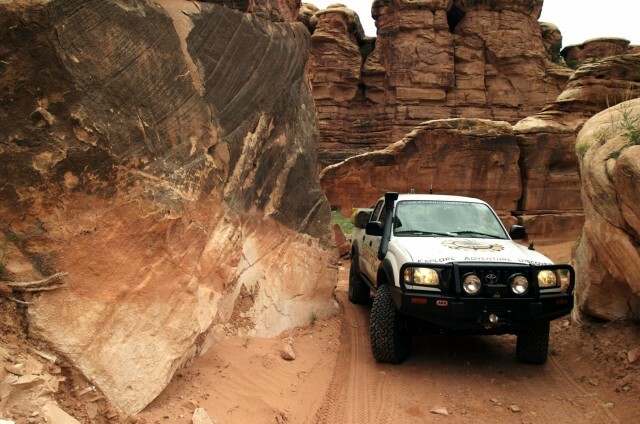 Devil’s Lane creates a narrow and challenging route through the Needles District of the Canyonlands National Park, and provides the only southern access to the Park. Entering the area is as easy as opening a gate and reviewing a series of information signs. We found it interesting, and gratifying, that the remote nature of this area provided a natural filter against graffiti and other vandalism. The signs were many years old and perfectly intact, a testament to the ethics of the few overland explorers who visit this area. Recent rains had turned this typically dry and dusty area into a verdant chain of small valleys, with green grass as high as our knees and wildflowers beginning to bloom. The valley floors provided a sharp contrast to the red rock walls and distant spires of Cedar Mesa sandstone. The photographic opportunities here were awe-inspiring, and our progress slowed to a crawl as photographers from each vehicle captured their impressions of the area. Chris stayed in the tail gun position and let the group drift off into the distance, freeing him to capture the distant valleys and fine details of the surrounding rock. Reliable long-distance communication with two-meter radios allowed the group to spread out and take in the scenery at our own pace. 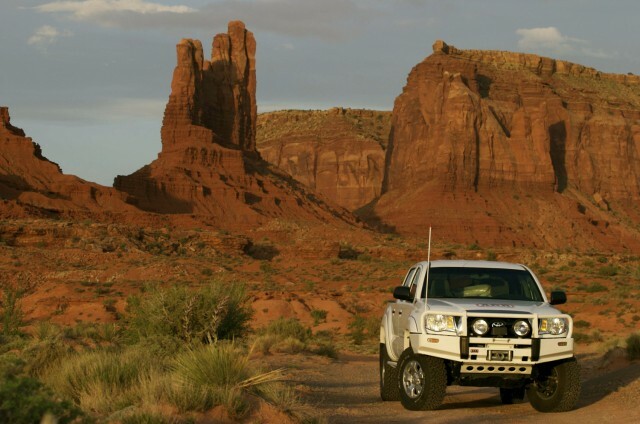 Our route terminated with an exciting run through Elephant Canyon, which provides an excellent 4WD challenge as the vehicles climb steep switchbacks and negotiate the deep notches and steps found on the formed sandstone route. One switchback in particular was a significant obstacle, requiring the driver to actually back up the switchback to make the next corner. 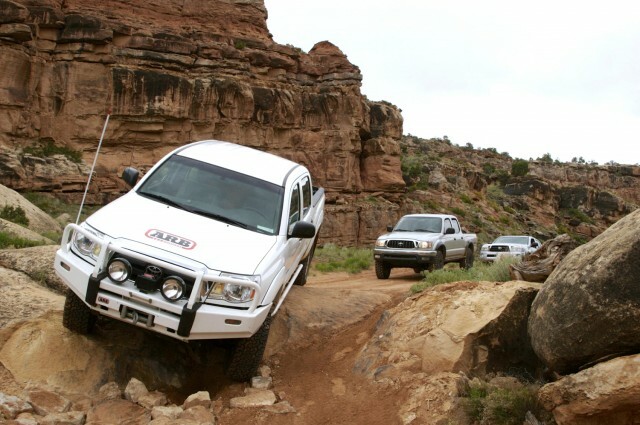 Our long-wheelbase Toyotas had an easy time on the steep climbs, but the narrow and tight turns needed constant attention and the occasional spotter to prevent damage. 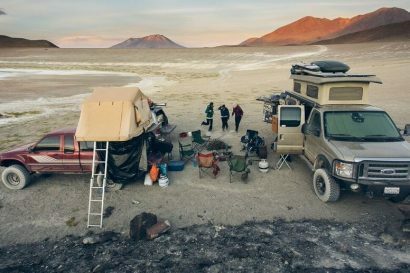 The final obstacle brought our group down a loose descent scattered with foot-tall ledges into a graded national park lot filled with motorhomes and minivans. Elephant Hill was a natural gatekeeper, preventing the throngs of rental cars from invading this fragile and silent landscape. Nearly everyone in the lot stood and watched as our group negotiated the last few ledges and rolled out onto the gravel. We had traveled over 100 miles off-highway, and this vehicle-dependent expedition had brought us through the land of the ancients and left us with memories that would last a lifetime.